A Vancouver-based agricultural tech firm is quickly making believers of Canadian farmers with pheromone-based insect control systems that virtually eliminate the need for insecticides. In a two-year field trial of a Semios computer-controlled remote pheromone delivery system on Allan Patton's apple orchard in Oliver, the concentration of apple clearwing moths dropped from 200 per acre to just five. "I stepped up and volunteered for the pilot after I got a bit worried about the (clearwing moth) counts on my orchard," said Patton. As a director of the Okanagan-Kootenay Sterile Insect Release Program - another chemical-free insect management system that employs pheromones - Patton wanted to be on the cutting edge with the newest technology. "The (Semios) system worked phenomenally well," he said. The clearwing population in Patton's orchard is now well below the 100-per-acre threshold for spraying insecticides and that suits him just fine. When the trial ends, Patton intends to become a customer. Between moth traps, sterile insects to control another pest, a healthy population of beneficial insects and now an automated pheromone control system, Patton has little use for toxic chemicals. 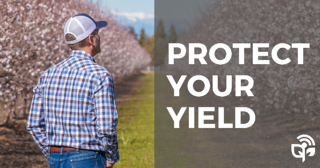 "I use very little insecticide in the orchard and I want to keep it that way," he said. A one-year trial of a Semios codling moth pheromone system at Ontario's Algoma Orchard produced similar results. The system floods the orchard with compounds that are produced by female moths to attract males to mate, ensuring they have no way to find each other for the purpose of procreation. 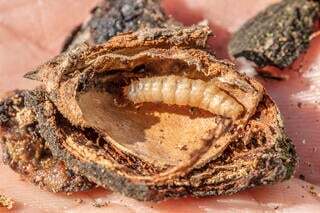 The larvae of the clearwing moth - introduced to Canada about 10 years ago from Europe - tunnel under the bark of apple trees, damaging and killing them. Codling moth larvae burrow into the fruit, literally the worm in your apple. Semios recently received regulatory approval by Health Canada for a pheromone that controls oriental fruit moth, the company's first in Canada. An application for the codling moth pheromone is under review, while the clearwing product is still in trials. Pheromones are not a new way to control insect populations, but older systems required pheromones to be distributed manually in hundreds of locations over many acres, requiring hours of labour during times in the growing season when help might be in short supply, said Semios CEO Michael Gilbert. "Old pheromone technology was labour intensive and cost prohibitive," he said. "That said, where pheromones have been widely adopted such as Washington apple growers, they have been successful." What Semios markets is not just pheromones, but an integrated computer controlled system that uses remote cameras and sensors to monitor pest pressure (the number of insects per acre), weather conditions and moisture levels at locations throughout the orchard and then automatically deploys the sexually confusing compounds when and where they are needed. 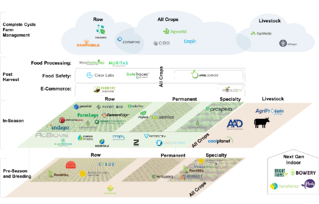 "Our mission is to ensure that growers' decisions are data-driven," said Gilbert. Often decisions about what happens in farmers' fields is driven by experience from past years, hunches and attitudes about the environment, rather than real-time monitoring of current conditions. "Pheromone-based pest management is better than insecticides, but it is more complex, so we created this platform to do that," he said. "The beauty of pheromones is that they are species specific - so beneficial insects like bees are not harmed - but that means you need a different pheromone for each insect you want to target," he said. 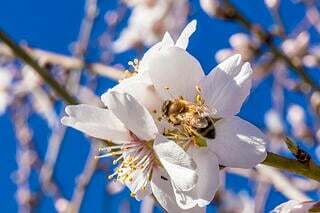 Semios is developing a suite of pheromones for its system to control at least eight common pests that attack fruit and nut trees. Farmers can deploy one or several pheromones at once depending on their needs, which vary by region and local climate conditions. "Grapes in B.C. have different needs than grapes in France or Italy, but there will be a mix of pheromones that will work for each given area," he said. According to Statistics Canada, about 28 per cent of B.C. farmers report using insecticides, well above the Canadian average of 15 per cent. But producers of tree fruits, grapes and berries are under considerable pressure from wary consumers and environmental groups that publish regular reports detailing the chemical residues found on grocery store produce. So farmers are hungry for alternatives to insecticides. 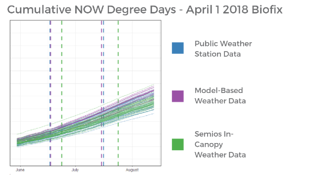 "This is good science and it's the technology that farmers want," said Patton, who also uses Semios weather and moisture sensors for frost control and irrigation. "We all benefit from this kind of science."